A reader sent me an email as follows: "I took a picture of a Christmas sign put up in our neighborhood... the 2nd amendment is alive and well in our area!" True, Ron Paul tells you what he knows and things... too bad he comes off like the crazy uncle. seems everything coming from the government and the media is "doublespeak"...here in mississippi the thievery is pretty bad..we have taken to keeeping loaded guns, locked doors and someone is always home..if the dogs dont get them first. We're pretty lucky that the neighbor's son is unemployed and has moved back home with mom and dad along with wife and 2 kids. He repairs 4 wheelers at home and keeps an eye on the neighborhood. Our area is crime free. I have gained a certain reputation in the neighborhood for checking on property intruders with a dog by my side (German Shepherd or Doberman) and a shotgun in hand. It's great to hear of all these folks who are looking out for their neighbors. That's the way it should be, of course! But what good would any of us be at policing our neighborhoods without a firearm? Constitutionally, we have as much right to carry one as a police officer. Also as much right to make an arrest (citizen's arrest), but our liberal leaders sure don't want us to know this! Once with my gun in hand I chased off an intruder attempting to break into my home. Then I called the cops. When they arrived, they informed me that I should let them handle intruders, to which I informed them that they weren't around at the time! As for all the talk about how crimes are on the decline, they also claim unemployment is down. It could drop by one-tenth of one percent, but by golly, they're right, it's down! Actually, unemployment is much higher than they admit. No doubt so are all crimes. But liberal deceivers always find a way to manipulate the facts. If we can all realize one important thing, it would be that our liberal-progressive leaders never tell us the truth. NEVER! Once we know this, everything else begins to make sense. I'd go with the guns not the dog. Our American Pit Bull Terrier would most likely lick the guy until he begged for mercy. She's a great visual deterrent thanks to media stereotyping, but in reality she's no guard dog. I don't believe these type of crimes are declining. Our gov't is full of it, as usual. Mrs. Lewis, I'm so happy that you used the picture I sent! I realized later that I neglected to tell you that my husband and I were the ones who wrote the warning sign. I wasn't trying to be coy, it's just that when I wrote to you, I was typing with one hand, holding a crying baby in the other and also had a hungry toddler asking for a snack. 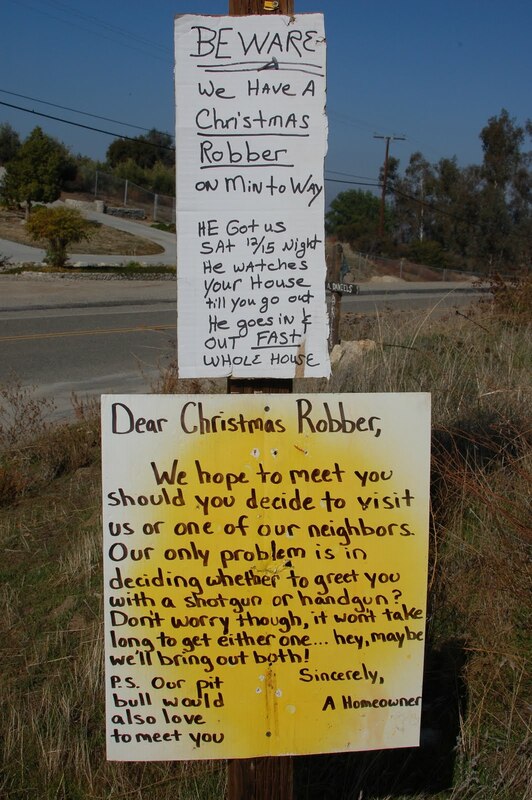 :) As your other readers have commented, crime is on the rise here as well. California can't afford to keep all it's prisoners in prison anymore, so they are simply setting them free. Guess what that does to previously decent neighborhoods like ours? We pray together every night for this country... God help us. Hopefully Ron Paul gets elected so we can salvage and preserve what remains of our civil liberties. Oh, and Violet Sky... you are right, our Pit Bull doesn't fit the aggressive stereotype at all, except when we are threatened. Someone dumped her on our rural road and although she's not the sharpest knife in the drawer, she is as fiercely loyal as they come. (Chased off an intruder one night and twice kept our family from stepping on rattlesnakes in the dark!) My advice, get yourselves some good dogs, some good guns and pray, pray pray!